NMS BLOG CENTRAL – All these and more. Flawed studies II. Occam’s Razor and How to Reduce Fructose Consumption. — last words of outlaw in the American West before being hanged. The principle known as Occam’s Razor is usually understood as a statement that a simple explanation is preferable to one that is more complicated. The principle has many variations. It might be interpreted as saying that you have to have a sense of priorities. Occam’s Razor is not exactly a scientific idea so much as a principle of aesthetics expressing the value of elegance in scientific explanations. Named for William of Ockham (c. 1285–1349) — it is also referred to as Ockham’s Razor — the idea can be described mathematically by saying that if the outcome, Y, of an experiment can be expressed with a rough sort of equation: Y = A + B + C +… and if A explains Y, then you don’t want to drag in B, C, etc unless you absolutely have to. (A more compelling description might be to consider the principle in terms of a power series and if you are inclined to mathematics, Wikipedia has excellent description and animation). Where we’re going. The bottom line on this post is that for obesity, diabetes and general health, the predominant effect of diet, the major contribution to the outcome — A in the equation above — is provided by substituting fat (any fat) for carbohydrate (any carbohydrate). That’s what the science says. That will give you the best effect. The B contribution (type of fat, type of carbohydrate) is strictly secondary. The practical consequence: if for some reason, you want to reduce fructose in the diet, the best advice is to reduce carbohydrate across the board. You can then add the additional advice “preferably sugar and high fructose corn syrup” but even if B doesn’t kick in, you will surely get a benefit. Most of all, if you take out Pepsi® and put in Pepperidge Farm® Whole Wheat Bread, you may not accomplish much. In practical terms, confronted with a phenomenon that has many controlling variables, make sure you can’t do with one before you bring in the others. In nutrition, when people say that the phenomenon is very complicated, they frequently mean that they don’t want to look at a simple explanation. On its practical side, if a patients in a dietary experiment responds to the level of carbohydrate, you have to assume that carbohydrate across the board is the controlling variable. If, however, you think that it is specifically the fructose in the diet that caused the effect, or if you think that it was an additional effect of fructose beyond its role as carbohydrate, then that is something that you have to show separately. Until you do, the fructose effect is sliced off by Occam’s Razor. In terms of policy, you don’t want to go after fructose unless you are sure that it is not primarily the role of fructose acting as a carbohydrate. So, there is a logical question surrounding recommendations against sugar and especially against fructose. What we know well in nutrition is that if you replace carbohydrate with fat, as in Krauss’s experiment described in the previous post, things improve and this is why we suggest low-carbohydrate diets as the “default diet,” the one to try first for diabetes and metabolic syndrome and probably for cardiovascular risk. I have, however, received at least two emails from well-known nutritionists saying that “the type of carbohydrate is more important than how much carbohydrate” and, of course, Rob Lustig is everywhere telling us how toxic sugar is but never suggesting that a low carbohydrate diet is any kind of ideal. On the face of it, the idea doesn’t make much sense. Fructose is a carbohydrate so the amount and type are not easily separable. There are all kinds of strange things in nutrition. People actually say that the type of diet you are on is less important than whether you stay on the diet. While true, it is like saying that if you are baseball player, whether you get a hit depends less on who’s pitching than whether you remember to show up for the game. But anyway, I decided to ask the question about relative importance of type and amount of carbohydrate on facebook and on a couple of blogs where things like Hizzona’ Michael Bloomberg’s Big Bottle Ban or related questions was being discussed. Here’s how I put it. ANS: 2. Replace carbohydrate with fat But I want to add; not replacing ALL the carbs. Only the worst ones. You know; Sugar, grains (bread and pasta) potatoes and rice. RDF: You can do that in a real case but the question is about first-order strategies. You only get 3 choices. ANS: okej 2. Replace carbohydrate with fat. But, of course, Krieger was right. The question is not really answerable. Not because it is false so much as because it is confused. Fructose is a carbohydrate and whatever its unique contribution, it is hard to say it is more important than the contribution of the fructose as a carbohydrate. It is a screwy idea but, again, that’s how it was phrased to me in emails and probably in print someplace. Researchers in this field say: “it is not carbohydrate per se (or glycemic index/load) that is involved in adverse metabolic effects of dietary carbohydrates, but rather the type of carbohydrate,…” The kind of evidence that is used to support such an idea, the kind of result that is used to support fructophobia is in the paper by Stanhope, et al. Stanhope, et al. measured the effects of chronic consumption of either glucose- or fructose-sweetened beverages providing 25% of energy requirements for 10 weeks in overweight and obese subjects. 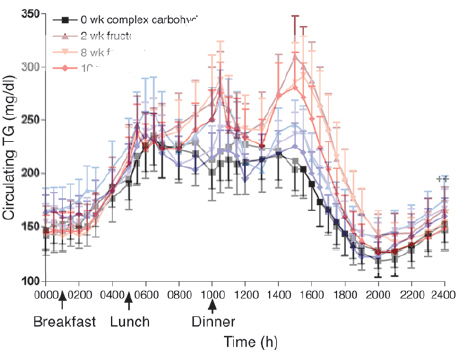 The figure below shows the superimposed outcomes in the response of triglycerides in the course of a day (red lines = fructose, blue = glucose). It is obvious that there is a difference — people consuming fructose had higher triglyceride responses (although fasting levels were not different). Looking at the figure, though, there is big variation in the data and it is not clear that everybody showed big differences between the glucose and fructose curves: the error bars represent standard error of the mean (SEM) which, while it shows you that there may be a statistically significant difference between the trials, doesn’t display very well the spread of the individual values, that is, whether a few individuals biased the grouped data. To convert to standard deviation, which gives you a better feel for the variation, you multiply, in this case, by about 4. In other words, there must have been big overlap between the fructose people and the glucose people. Another way of looking at Stanhope’s experiment is to recognize that it does not show, as the title says, “Consuming fructose-sweetened, not glucose-sweetened, beverages increases visceral adiposity and lipids… in overweight/obese humans.” What the paper really is about is “Consuming fructose-sweetened, not glucose-sweetened, beverages as part a high carbohydrate diet (55 % of energy) increases….” In other words, you don’t know whether you would get any benefit in changing from fructose to glucose if the total carbohydrate were lower. In terms of our Occam’s Razor equation, you can’t say that you have proved that your results are due to A (the major controlling variable (carbohydrate)) when all you have studied is A with the specific change in the B term (secondary effect of the type of carbohydrate). Stanhope’s experiment shows: if you are on a high carbohydrate diet, replacing glucose with fructose will make things worse but that’s different than saying that fructose is toxic. From a practical point of view, if you are on a high carbohydrate diet and it is not giving you the health benefit you want, replacing sugar with starch may give you disappointing results compared to simply cutting down on carbohydrates. How to Reduce Fructose Consumption. If you want to encourage fructose reduction, encourage carbohydrate restriction (this is where we have the most information) with the additional proviso of recommending fructose reduction as the first carbohydrate to remove (may also help but we have less data). 2. Where are the pictures? The author has an obligation to make things clear. A graphic representation is usually an indication of a desire to explain. 3. Has Occam’s Razor been applied? Are secondary effects taken as primary? Aha. I thought so. My answer was to replace carbohydrate with fat. Given the choices, that makes the most sense to me and, in fact, that is the first thing I did when I decided the high carb low fat vegetarian thing wasn’t working for me, long before I decided to go LCHF. Great post! Occam’s Razor will do it. Crabtree’s Bludgeon…nice. I’d never heard of that one, but much of what one reads about nutrition fits the description nicely, also most discussions regarding politics, religion, or fashion. When the term Crabtree’s Bludgeon is not used, another favourite is Paradox, usually with an added American-style chauvinist descriptor such as French. In addition, one may often have another added Canto to that Classical Epic “Paradigms Lost”. Well put… as usual. One of my red flags is when I read “but of course this is a complex. multi-factorial problem…” That may well be true but as soon as I read it, I am on my guard that this person may not be thinking incisively. I appreciate the way you use the razor to cut through fructose as I feel the same way about complex explanations like the “Food Reward” hypothesis… I have asked repeatedly but have yet to be furnished with examples of “highly palatable” foods that are not coincidentally high in sugar and/or refined starches. I can think of several that are ONLY sugar and/or refined starches (soda being the primary example) but none that are ONLY fat. Why do we need the brain as an overarching conductor somehow deciding what our body-wide fat-mass set-point needs to be, when we have relatively simple local processes throughout the body which can accomplish the same? Relatively simple local processes that in all likelihood evolved long before we even had anything recognisable as a brain? I think that the problem that you are discussing relates to a confusion of behavior, endocrine function and metabolism which, while they interact are primarily independent. In fact, I would describe it as the single greatest barrier to good understanding in the field leading people to go with the idea that obesity is a stimulus and fat cells secrete adipokines and other hormones and that tells your hypothalamus to eat or, depending on other things, to not eat and that controls your appetite. The effect of carbohydrate and insulin on metabolism is separate from the effect on the endocrine system. And behavior is also separate. It is not a great insight to say that we eat because things taste good and, for some people, that over-rides hormones. Also, as FatHead always says, we have a brain which can over-ride everything. Low-carbohydrate diets are effective because they give better control of appetite but they also provide a different metabolic state so that what you do eat is processed differently. On foods that have no sugar and encourage eating are bacon and eggs. For those that encourage over-consumption, cheese is the best example but the degree of consumption may be related to residual carbohydrate — Dr. Atkins recommended hard cheeses. Thanks for your reply. I am not sure if you are suggesting that bacon and eggs or cheese is an “highly palatable” food in the same way perhaps that one might talk about pringles chips? The latter is often cited as a food that once started is hard to stop eating. I personally find eggs, bacon and [full fat] cheese self-limiting and satisfying. Indeed I frequently see it mentioned (albeit anecdotally) on blogs and forums how a switch to eggs and bacon for breakfast, seems to leave many (most?) satisfied fro hours and no longer reaching for a mid-morning snack as they might well do after say cereal and OJ. Some even go on to skip lunch without even noticing. But accepting that some might find eggs and bacon hard to stop eating: I would then wonder how much of that is due to their protein content and its stimulus for insulin secretion — particularly in individuals who already have chronic high insulin levels with IR? I guess I would be more sold on the idea of “Food Reward” if folks started chugging down bottles of olive oil… especially if it were brightly labeled and highly marketed. I agree that we do have the ability to exercise conscious control for a short time but ultimately I am convinced that our bodies will win out in any struggle between “brain” and body”.. an extreme example to be sure but try holding your breath in the deep end of a swimming-pool. In my view, “hunger” is a similar primal drive. yes. Bacon and eggs is unquestionably more filling for most people. “Palatable,” however, refers to taste. “Stop eating” refers to behavior. Two different things. I agree, overall, at least in humans, sugar is certainly more reinforcing than other nutrients, and fat is more satiating at least on the short time scale. Breathing is different than consummatory behavior. You can hold your hunger until you die if you think it is important — Sartre was wrong. People do go to the gallows over the ontological argument. It was observed that those students who at the Union Theologic Seminary (Rabbinical school) who were best at fasting on the high holy days were the ones who were overweight. The explanation is that they were less likely to eat in response to physiologic stimuli — more likely to eat in response to taste — so if you gave them a reason not to eat (religious commandment), it is easier for them to comply. One of Napoleon’s generals (Pichegru) was said to have committed suicide in prison (after a failed coup against his nibs) by tying a string around his neck then using a pencil to tighten the tourniquet. He then propped the pencil behind his ear and waited. Actually he was more likely murdered by his jailors, but the story is not at all incredible. Military discipline can work wonders. Cheese is definitely moreish, hard or soft. One can eat too much, but even too much cheese is not a lot, it is still highly satiating despite being highly palatable. Point being that in either of these cases we are only looking at the short term… and I see this all the time with folks (especially those who buy in CICO) talking about what they ate “today” or “at this meal” as if that is the most important factor in terms of body make-up over the long term. I am not sure what the original point is here. A very enlightening and well written post, as usual. Thank you for sharing your insights. Using occum’s razor from another angle I would ask: do our cells function optimally using fat (and fat derrived ketones) as the primary fuel, or by using glucose? If it is fat, then it could follow that fat should comprise the majority of calories. If it is glucose then carbohydrates might be best. It would be interesting to see experiments to determine optimal cell function by fuel source. Then experients could determine which macronutrient ratio optimizes the desired fuel for cells. Since the body can make all the glucose it needs through gluconeogenesis, it seems that we should need to ingest little if any carbohydrate. Do you think this is true? You have several questions here. Our sense of the “optimal” state of cells is one where they have metabolic flexibility. Brain relies primarily on glucose and heart primarily on fat but both can use ketone bodies if necessary. I don’t think there is such a thing as ideal but the behavior of different tissues with different fuel sources has been studied http://www.ncbi.nlm.nih.gov/books/NBK22436/ is a good summary. Different cells have different relative rates of dealing with different macronutrients and, in general, it is a system problem, that is, each tissue’s needs are tied to the fuel requirements of others cells. Optimal cell function also depends on what kind of exercise, age, etc. One of the signs of obesity, diabetes and metabolic syndrome is the inability of cells to switch to new energy sources. And, of course, there are huge individual differences. The question as to what you “need” is different. You do not need to ingest any carbohydrate. There are places where you need all the terms in the equation and applying Occam’s Razor may be tough. At 50 g/d, I don’t think you have to worry about fructose. Wonderful post and perfect to link to my own new post on Fructose and hepatic de novo lipogenesis where I quote your Fructophobia post. Pre-Atkins low-carb diets (quoted by Taubes) included fruit among allowable carb ration (as does Groves, Yudkin, Mackarness) and were arguably some of the most succesful variations. I have not seen this paper. The theory seems relevant although, as you describe it, a great generalization. Here is the link to the abstract. The paper is freely down loadable (Dove Press). Spreadbury’s paper deals with the fact that somehow or other fat is always involved, but not necessarily the way established circles like to take for granted or ‘believe ‘ firmly is acts. A very nice unassuming gentleman. I had sent you a pdf but I must have been using an outdated email address. There appears to be something important going on in the gut flora and this paper takes a stab at explaining that along with tying together some other disparate threads. Kreiger was right? About what? You didn’t present a false dichotomy. It’s not black or white thinking to ask the question because, it is true that the choices exist. He knows what the answer is but is too caught up in his own BS to answer the question honestly. Good blog by the way. There is something wrong in the question: glucose v. fructose or fat v. carbohydrate is confused in that glucose and fructose are carbohydrates. You can’t really answer the question because at high carbohydrate as in the Stanhope experiments, you really don’t know which would have a bigger effect for small changes. It is the fructophobes who are at fault for the lack of logic. In the big picture, of course, fat for carbohydrate will generally have better effect than glucose for fructose. Krieger is at fault, however, for choosing D. I don’t want to play. (I feel bad for his kids). Please take a look at the McCarrison Lecture on Modern Industrial Fat and Types of Beef Available to the Science-Based Societies (us). “Being introduced to Poly by Mbogo has at least given me a new understanding of the meaning of nature, nutrition and health. It needs to be remembered that we emerged from the Stone Age only 150 generations ago. Our physiology is still adapted to eating wild foods, or if you like, Sir Robert McCarrison’s ”unsophisticated foods of Nature” . We are a wild strain in a modern nutritional environment. At the beginning of the 20th century, beef animals were already becoming obese. But then we used a lot of that beef tallow and sheep fat to make candles. With the advent of electric light bulbs, ways and means were found to put that fat into the food chain. We now eat the candles! Thank you once more for a stimulating discussion of these interesting matters. I have purposely not mentioned Billy O’Ockham because there isn’t enough room on the page. Great post! I enjoy your writing style. I see that the fat in the high-fat diet was primarily lard. Do mice have the same adverse reaction to a high-fat diet that’s low in linoleic acid? I don’t know the answer to that although I think that there are some studies in the literature. My point being that your study may be demonstrating the effects of a high linoleic acid diet, and not a high fat diet. Different fats in humans have wildly different effects, with high linoleic acid medical foods like Intralipid causing liver damage, whereas Omegaven, a fish-oil based alternative, does not (and even allows the body to heal the liver damage caused by Intralipid). That is certainly a possibility but the key point is that carbohydrate had no effect on this which, regardless of the fatty acid, is still considered key in human nutrition. Nice study. My wife got a fillet of salmon the other day that was inedibly fatty. I wonder if this explains it? But what about Dr. House? He helps people without helping himself. You can’t argue from a doctor’s personal habits about the efficacy of their treatments. I have a new take on the obesity epidemic that can explain some anomalies between different high-carb times and cultures; the role of thiamine fortification as a potential facilitator of lipogenesis. I’m looking not so much at an obesigenic effect of thiamine, as an anti-obesigenic effect of marginal thiamine status in the past, and in rice-eating countries, due to sub-maximal activity of pyruvate dehydrogenase. I will look this over. What they’re saying, Tuck, is that excess linoleic acid gives you the munchies. Glad to see you got it. We always ate the candles. We put olive oil in lamps instead. Fructose can promote DM2 pathology via SIRT1 activation. Increased traffic through mito complex 1 increases NAD+/NADH ratio which promotes SIRT1 and Fox01. So carbohydrate restriction inhibits physiological toxicity of fructose. I haven’t read the SIRT1 paper but rat hepatocytes cultured in 5 mM glucose with an abstract that begins “Consumption of a fructose-rich diet leads to insulin resistance and dyslipidemia in part due to elevated gluconeogenesis and lipogenesis” is not promising for deductions about diet. Why would gluconeogenesis cause insulin resistance? “so carbohydrate restriction inhibits physiological toxicity of fructose” doesn’t make a lot of sense. The point of the post is that fructose is a carbohydrate but, in any case, the physiologic “toxicity” of fructose depends on high carbohydrate. Not having an effect is not equivalent to inhibiting an effect. Excess gluconeogenesis is symptomatic of insulin resistance. The question might be whether fructose triggers more gluconeogenesis than is needed to convert the fructose. Whether it is a driver of glycogen or amino acid use as well. That fructose still turned to glucose in the presence of so much glucose might mean something. Yes, the abstract jumps to the conclusion that the paper doesn’t really illustrate. Why would gluconeogenesis cause IR? And why would IR support dyslipidemia? Shouldn’t it LOWER hepatic lipid output? I call this the metabolic push-me-pull-you. When a process results in excess production of BOTH the main energy substrates, what is fuelling it? Excess gluconeogenesis is a response to, not a cause of IR. Yes. And hyperlipidemia is an over-response to insulin. So that sentence in the abstract is nonsense. Throw in elevated FFA from pre-existing obesity, then consume fructose on a high-carb diet, and it might just begin to work. I am not sure what the question is. High glucose leads to high insulin fluctuations which increases triglyceride. There is an extremely close relation between carbohydrate and triglyceride. So IR promotes gluconeogenesis, which leads to hyperglycaemia, at which point insulin becomes high enough to overcome IR and the excess glucose becomes lipogenic? A scenario like this makes it appear at first as if the triglyceride is ultimately coming from the gluconeogenic substrates, the glucogenic amino acids and glycerol. But then some of these (alanine, glutamate and glycerol) could be products of the fed glucose. There had seemed to be a whiff of the perpetual motion machine about it (or an unusual breakdown of protein). But if there are in fact oscillations between IR+GNG and IS+DNL, this would explain the “paradox”. Time the confounder. An experiment measuring total outcomes would not pick up biphasic output. Thanks for this explanation, which brings things back into line. In type 2 diabetes, hepatic insulin resistance is associated with increased glucose production (HGP) and ApoB-containing lipoprotein secretion. The former is arguably the cause of deteriorating glucose control experienced by most diabetic patients over time, regardless of therapy (Monnier et al., 2003). The latter underpins the predisposition to atherosclerosis, which ultimately will be responsible for nearly one in two deaths among diabetics (National Institute of Diabetes and Digestive and Kidney Diseases, 2005). In recent years, the idea that the diabetic liver may harbor a noxious brew of insulin resistance and excessive insulin sensitivity has gained a second wind. Except for the fact that few scientists, and little science, are mentioned, it is a good sign. Pardon my off topic comment: Robert Lustig has repeatedly claimed that fructose glycates/fructates at a 10 times faster rate than glucose in vivo. It seems reasonably established in vitro, (depending on the type of protein) but is there sufficient in vivo evidence to support this? Serum fructose can reach 5mg/dL, which at first glance appears to be insignificant, but multiply that by a factor of 10 and you have a predicted glycation activity of the same magnitude as hyperglycemia (perhaps this calculation is erroneous though). Also, the fructose concentration in the portal vein (before reaching the liver) might be considerably higher after a high fructose meal, but I couldn’t find any clear-cut measurements. This is possibly a mere anomaly, in which case we’re still left to explain it. In science, you’ve got to account for all the data, not part of it. If the study is flawed*, you’ve got to prove it by replicating. If 344 Fischer rats are more resistant to fructation, you’ve got to prove it and provide mechanisms. In Lustig’s mind, we ought to conveniently ignore everything that speak against his unmistakable wisdom and move straight to government intervention. History tells us this ultimately leads to disaster. Scientifically proving something is a one way street, I think we still have a long way ahead of us, that is: assuming that we’re looking in the right direction. 1.The burden of proof is on showing fructosylation since fructose is cleared while glucose is maintained (normally) at 5 mM and if higher, AGE goes up. 2. The reference (Lingelbach) shows little effect of fructose on glycation which depends on blood glucose. If you plot the glucose (Table 2) against the glycated hemoglobin (Table 3) there is good correlation (k=0.78)and pure fructose points fall on same line as all the others(k=0.77). 3. Caveat is that it is pentosidine that is measured and I don’t think that measures all the AGE products so there are conceivably fructosylated proteins but, again, youhave to show that. On the policy, philosophy which Lustig represents, we are asked to believe that because of weak epidemiologic evidence fructose is assumed to be bad although the effects of fructose have only been measured under conditions of high carbohydrate. Sound familiar. Thank you for the detailed explanation. 1)The concentration of fructose, although it’s cleared from the blood stream quickly, is still significant I think. It can hit the systemic circulation at 0,27 mM after a high fructose meal, and assuming that all those in vitro studies are correct, you’d expect this to act like a 2.7 mM increase in BG in terms of glycemic stress. Fructose is a precursor of all the AGEs that are listed in the Lingelbach study (at least, based on in vitro evidence). But again, the actual results don’t agree with this. 2)If I understand this correctly, the concentration of intracellular fructose in different tissues depends on GLUT5 expression and polyol activity in response to hyperglycemia. Hepatic fructose metabolism also involves fructose-1-phosphate and glyceraldehyde, but that’s the only distinction from glycolysis as far as I can see. Glyceraldehyde seems to be another glycating agent according to this , is this of any relevance? Too many question, too little answers, me thinks. I don’t know how much you or readers know about this system so I’ll just list some basic points. First there is a kind of paradox in the basic chemistry. 1. All carbonyl groups are reactive with respect to reaction with nucleophiles (like amino groups on proteins or hydroxyl groups). 2. Aldehydes are more reactive than ketones. That is why glucose (aldehyde) exists in the cyclic form (intramolecular reaction) and why fructose (ketone) exists more in the open chain form. 3. Now, in solution, although glucose is inherently more reactive than fructose, more of it is folded up and therefore has less of the reactive form. 5. I don’t know whether anybody has specifically looked for fructosylation by plasma fructose but I suspect it is small. On the intracellular reactions of fructose, the key point are the rates. Fructose-1-P is formed very rapidly but aldolase-B which creates triodes is slow so the problem with fructose is that F-1-P builds up (described as tying up phosphate or reducing ATP and there is a persistent generation of trioses. The key point, though is that all of these conversions are enzyme-catalyzed (fast) while the intracellular AGE formation is non-enzymaic (slow) so you have to have actual outcome data before you can say anything. the reference you sent above is for tissue culture and while interesting is of unknown relevance. The whole problem with fructopohobia is that we keep talking about what could happen, rather than what does. Don’t know if this helps. I gave a wrong link, sorry, I meant this . Dr. Feinman, thank you for the great summary, very helpful. Point 4 is a smart remark, I hadn’t really thought about it that way (take out the AGEs and return to equilibrium). Perhaps I’m just a stupid yank for asking the following questions. 1) Are the open-chain and cyclic fructose in a fixed equilibrium (in serum)? I always assumed this to be the case. 2) Assuming, for the sake of argument, that this equilibrium (ratio [openchainfructose]/[cyclicfructose] ) is fixed in serum no matter what the circumstances, than Lingelbach should have noticed fructolysation, because as far as I know, postprandial fructose is significant per my previous comment. This is a really rough calculation and it could be dead wrong. 3) You could calculate the individual contribution of glucose vs. fructose mathematically were there any formulas for AGE formation against time. That way, you can also implement your point 4 in the equation. That’s an interesting assignment. I think it is a biological problem. Instead of calculating, just need to measure. In the eye, for example, 10-20 % of the glycation products are directly due to fructose (although the origins are presumably from glucose which is in ebuilibrium with fructose through the polyol ration (glucose = glucitol (sorbitol) = fructose). I don’t know off hand about plasma effects, however. The two unknown, or poorly known variables are the kinetics of fructose and the concentration of the other substrate but there probably is enough to get a rough calculation at least for HbA1c — for collagen, it is not a homogeneous reaction. I don’t think it has been done, however, but I at least will look for the kinetics data. I’m late… Pentosidine is not created at a higher rate by fructose, it appears. This explains the lack of difference in Ps in the Lingelbach study. But Lingelbach also measured “general AGE-related fluorescence in skincollagen”, perhaps we should pack our bags and move on, because it blows the idea of “fructosylation in extracellular matrix” out of the water or perhaps I’m overstating my case… It’s not unreasonable (double negative) to assume that the only possible mechanism through which fructose increases AGEs is by inducing IR and subsequent hyperglycemia. I think you made a similar point. For all intents and purposes, crosslinks in ECM comprises glucosepane, and the known precursor is glucose, correct? Lowering carbs across the board serves as immediate protection against hyperglycemia, especially in diabetes, and this is underappreciated IMO. Alec Baldwin: Dr. Robert Lustig is writing a book about the dangers of sugar called “Fat Chance: Beating the Odds Against Sugar, Processed Food, Obesity and Disease.” It will be out in December. Knowing what you know, what are things you don’t eat? What’s your diet become since you’ve been doing this work? Robert Lustig: I carry a few extra pounds and I’m not happy about it. I don’t eat sugar. Robert Lustig: – with whiskey sauce. Robert Lustig: Those are my two foibles. Robert Lustig: Twice a year. Alec Baldwin: – you’re doing well. Robert Lustig: Other than that no, I really don’t. To be honest with you it’s not because I did this work, it’s because it usually just doesn’t appeal to me. Alec Baldwin: And what are you eating that you think you shouldn’t be eating? Robert Lustig: Well, I have a half a bagel in the morning with cheese, that’s sort of my standard breakfast and my wife get son me for that. Robert Lustig: For lunch unfortunately because I’m running between you know patients, it often ends up something being very processed and it’s a real problem. Robert Lustig: For dinner though it’s a very standard dinner and I don’t snack between meals and I still can’t lose it. So I understand. I’m there. I’m part of it. Alec Baldwin: You can’t see your Leptin? So,he admits he has a weight problem, eats a bagel for breakfast + processed foods for lunch. Seems to be a case of not seeing the forest for the trees. Am I wrong? Discovered your blog this morning and spent half the day reading through it. Very interesting and informative, although I’m not convinced of some points (such as your perspective on ITT and the implications for causal inference). I certainly learned more about organic chemistry than I would have assumed with such a small time investment! However, I think you are contradicting yourself by applying Occam’s razor in this question of whether fructose or carbohydrates are the cause of improved outcomes in Stanhope’s article. You say it is flawed to infer that “the type of carbohydrate is more important than how much carbohydrate”. Applying the same logic, it is flawed to infer that “the type of calorie is more important than how much calorie”. Isn’t that exactly what you have done in several prior blog posts and your Nutrition and Metabolism perspective reinterpreting Krauss et al.? I think my objection to inferring that “the type of carbohydrate is more important than how much carbohydrate” the evidence from which we are to make the inference is inadequate. Partly, of course, it is not really a reasonable statement in the sense that if the type of carbohydrate matters, how much you have of that type matters so it can’t be more important but it is that they are generalizing from narrow conditions. I am not sure how this applies to Krauss who is guilty simply of (intentionally?) poor or even incorrect writing. When he says “Moderate carbohydrate restriction and weight loss provide equivalent but non-additive approaches to improving atherogenic dyslipidemia” and “the beneficial lipid changes resulting from a reduced carbohydrate intake were not significant after weight loss,” these are just wrong. The data show the opposite. I always describe this as “that which is not” which is the expression used by people in one of the places Gulliver went to in his travels, because their language did not have a word for lying. I don’t think I ever said “the type of calorie is more important than how much calorie” They are different things, even have different units and both are important. Stanhope says “Fructose…” and that’s not right. Sorry, I got confused about the many studies I encountered in reading through your blog posts. I was thinking of the Bray study, where you say “Now we do not have to change the figure at all but we merely relabel the x axis as ‘Carbohydrate Intake'” in my comment that you effectively said “the type of calorie is more important than how much calorie”. Bray plotted calories against change in fat mass and showed a better correlation than with protein as the independent variable. He set the experiment up this way to get the answer that he wanted: he set up a straw man of proteins as the supposed alternative to calories alone as controlling variable. However, critics of “a calorie is a calorie” usually emphasize carbohydrate because this is where you are most likely to see inefficiency due to the anabolic effect of insulin. So, to get the right answer, Bray kept carbohydrate at a constant percentage of energy. So his conclusion was that calories were the controlling variable. I merely showed that he had not proved his case because the way the experiment was set up, carbohydrate was proportional to calories so that it would be just as reasonable to say that carbohydrate was the independent variable. So the output variable was dependent on A and, at the same time, dependent on B. One was the true biological variable. The other was incidentally correlated due to the way the experiment was set up. So which is more likely? “A calorie is a calorie” is the standard interpretation and people appeal to the first law although that is based on a misunderstanding in my view. The alternative idea is that carbohydrate is not just a source of calories but also a control element. So, you might say that it is a question of whose Occam’s razor you use. In these kinds of nutrition experiments — those with an axe to grind — authors ignore anything that is contradictory and assume that their own experiment is definitive. 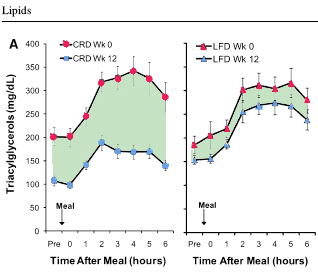 This was a metabolic ward study so probably more accurate on dietary record but the conclusion didn’t pan out because of the misguided experimental design. I merely showed that the results are indistinguishable from carbohydrate as the controlling variable. Succinct answer: I never say things like “the type of calorie is more important than how much calorie”. Calories are one factor in weight gain or loss. The disposition of the calories are determined by macronutrient composition, predominantly by carbohydrate, directly of indirectly through insulin and other hormones. I tend to agree with Robert Lustig. I think that it is sugar that is causing the obesity epidemic rather than carbohydrates in general. Americans ate carbohydrates for centuries without an obesity epidemic. The obesity epidemic didn’t start until shortly after we started consuming high-fructose corn syrup. The French still don’t consume high-fructose corn syrup and don’t have an obesity epidemic. As Lustig pointed out, sugar and HFCS are metabolically identical. The French use lots of sugar. And other things, e.g. flour and cereal, have increased more than HFCS during the obesity epidemic…and, of course, fructose doesn’t increase blood glucose or insulin as much as glucose does. In any case, my only point was that he hasn’t proved his case. I see. So your response to Bray is not that carbohydrate is the correct independent variable, but that it is equally plausible as calorie in this particular experiment (and that this ambiguity is a flaw in the experimental design). I’ll accept that. It seems that similar arguments apply to whether it is carbohydrate, or sugar, or fructose that is the true independent variable. It will require careful experimentation to disentangle this, and the simple application of Occam’s razor does not seem to suffice. A. Replace fructose in your diet with glucose. C. Doesn’t matter or can’t predict. Why this premise and why only these three choices? If a person wants to optimize diet for health, the best strategy very well could be to reduce fructose without the constraint that it be replaced by glucose. Or it could be to reduce glucose without the constraint that it be replaced by fat and to keep caloric intake constant. These might be useful experimental designs to help learn/understand the causal pathways, but we might learn that the best strategy need not impose these kinds of constraints. I won’t claim to know the answer, but it could possibly have the form, “eat to satisfaction, minimizing fructose, and with a strong preference of fat and protein over carbohydrate”. I am addressing the premise in Stanhope which was the point of the blogpost. I am not sure what your point is. Fructose IS uniquely bad? We don’t know enough to have any working theory? Just to confuse things further, one could construct an argument counter to Lustig around the adipogenic influence of high intakes of linolenic acid (omega 6 vegetable oil), and say THAT is the proximal cause of obesity. It would certainly be consistent with the observation that my generation, raised in the 1960s, ate unholy quantities of white sugar but were not much prone to obesity. Our takeaways – fish and chips – were fried in beef dripping. If, however, you substitute fat for carbohydrate, the type of fat and type of carbohydrate don’t seem to matter for most people. Most people, however, is not all people. But it is the role of a clinician, not a professor, to finesse a principle and “make it work” for the individual patient. It is the role of the professor to establish which principle is most likely to be true, so that the clinician is not entirely working in the dark. 1. Replacing dietary carbohydrate with fat (any fat except trans-) is beneficial. 2. In calorie restriction, low-carbohydrate diets do at least as well, usually better then low-fat. 3. Krauss’s study, the A-Z study and other show that the controlling variable is carbohydrate. 6. It is not excluded that the effects of carbohydrate are specifically due to the presence of fructose but, in the absence of other evidence, Occam’s Razor dictates that carbohydrate is the controlling variable and specific effects of fructose (or galactose or anything) are secondary. 9. it is not excluded that the effect of high glucose and high insulin is required for any unique effects of fructose. So, at high carbohydrate, 55 % or so, replacing fructose with glucose may be beneficial. But that’s all you know. Occam’s Razor dictates that the major effect is carbohydrate. The reason that you should be suspicious of a unique effect of fructose is that fructose is better for glycemic and insulinemic control in people with diabetes suggesting that it might be better for these effects in people with metabolic syndrome or even normal people and the reason that there is variability in Stanhope is that the benefit of better insulin control may offset the negative effects in other reactions. I came here after reading some of your interesting comments at The Skinny on Fat site. I can’t follow all the cellular biology speak that’s bandied about here. Not enough time put into that area of study. But it seems your issues with the Lustig stuff are very specific. One of the issues is that an oft-cited study about fuctose vs. glucose can only be valid in a high carb diet >55% because the effect has not been tested at lower carb diet levels. Maybe fructose has an effect at lower levels, you suggest, maybe not. Can’t say from that study. So I wondered what % carbs have been in the average American diet over the last 50-100 years. If we’ve been eating >55% for decades, then maybe the issue with the % is really a strawman. Table 1 and Figure 2 seem to suggest that carb levels were very high in the past (early 1900’s). As high as they are now. What’s different is the level of fiber. I’ve got to review my stats. Not sure how to interpret the coefficients and p-values. So help me out. Is this saying that 82% of the variability is explained by your idea–plain old carbs? In which case, it really is that rise in carbs. Or is the study suggesting that it’s the level of fiber, i.e. the type of carb that’s consumed? Figure 1 sure seems to be suggesting that. Later in the report, they throw out the statement “Fructose, unlike sucrose, has been directly linked to insulin resistance in small human and animal studies and has been implicated in every metabolic abnormality associated with the metabolic syndrome” and then link to 4 studies. I suppose those 4 studies would have to be examined as well, but it sure seems that fructose does cause problems. BTW, read your post on hunger. Have you read MINDLESS EATING by Brian Wansink? Your post reminds me of the point he’s making in his book. In a near future post, I will try to lay out my understanding of what we know about fructose. I know “Mindless Eating” and it is quite a good book and does make some of the same points as my hunger post. Isn’t all this based upon the assumption that elevated serum triglycerides is always a reliable marker for poor health. I’m not certain that this would be the case if PUFAs were removed from the equation, or at least minimised? No. I was only addressing the question: If you want to reduce triglycerides (good marker or not) what is the best strategy (within the limits of Occam’s razor). PUFA may be an additional factor (the B in Y = A+B+C) but I was suggesting what we know about is A (so have to go with Y = A until we know better). Reading the Scientific Literature. A Guide to Flawed Studies. Suddenly last summer. The triumph of carbohydrate restriction.